We don't eat gluten-free foods every day in my house, but we certainly have many gluten-free meals, sometimes by chance and sometimes intentionally. It can't hurt to give your body a break from gluten. 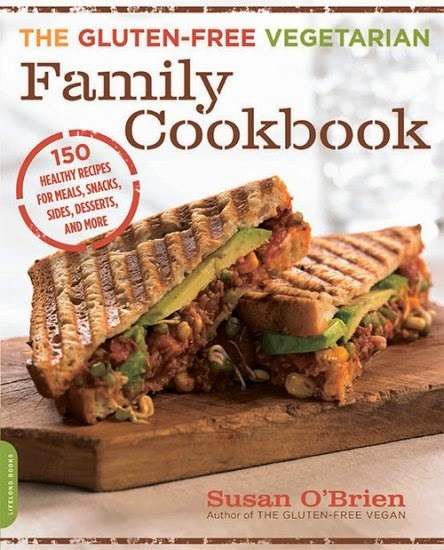 That's why I enjoyed reviewing Susan O'Brien's The Gluten-Free Vegetarian Family Cookbook: 150 Healthy Recipes for Meals, Snacks, Sides, Desserts, and More . This book combines three characteristics very nicely - the recipes are gluten free, vegetarian AND healthy. Because, as I'm sure you know, neither gluten free nor vegetarian in themselves necessarily equals healthy. Read on to try one of Susan's lovely recipes and enter to win a copy of the book. Avoiding the typical high-glycemic, gluten-free alternatives, this cookbook focuses instead on healthy whole foods. From breakfast muffins and pancakes to tofu fajitas and butternut squash bread, there are a wealth of delicious-sounding yet healthy options in this book. Although it is a vegetarian cookbook, many of the recipes are also vegan or can be made vegan. 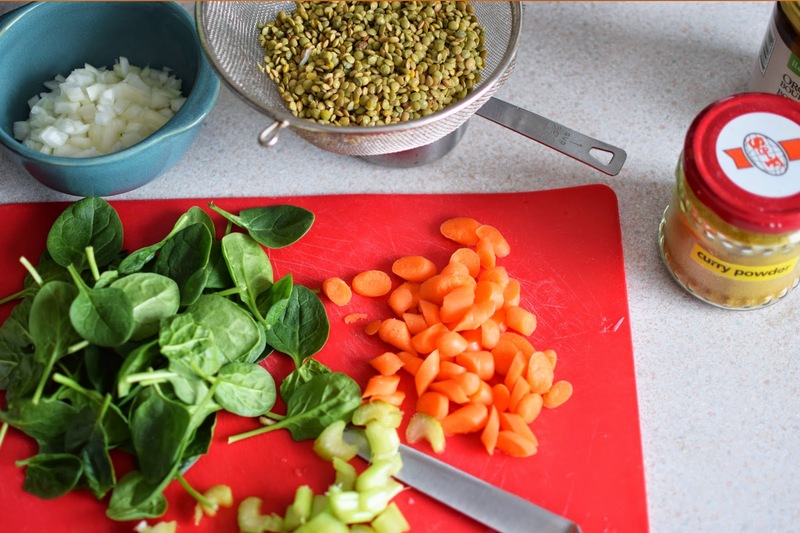 The first recipe I chose to try was the Curried Lentil and Spinach Soup. This is a great one for when you don't have a lot of groceries in the house. 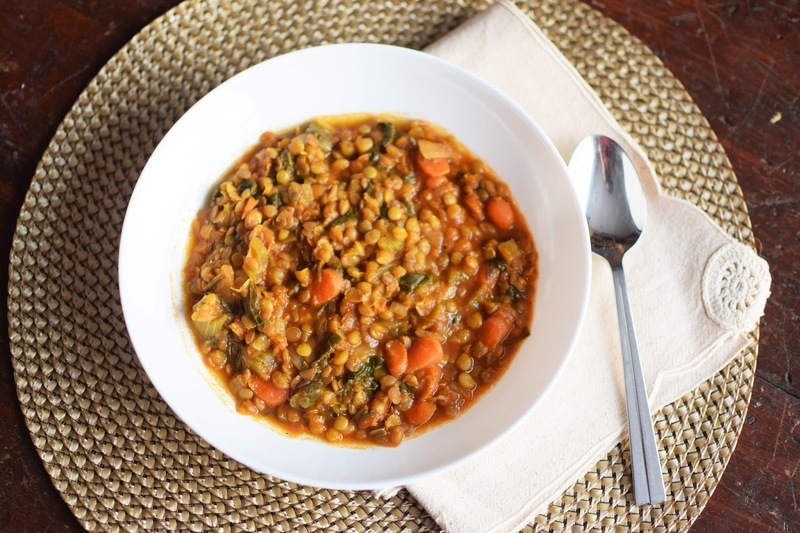 If you've got dry lentils in the cupboard and some carrots, celery and spinach in the fridge, you are good to go. This is a fitting example of a recipe that's gluten free without really trying to be. 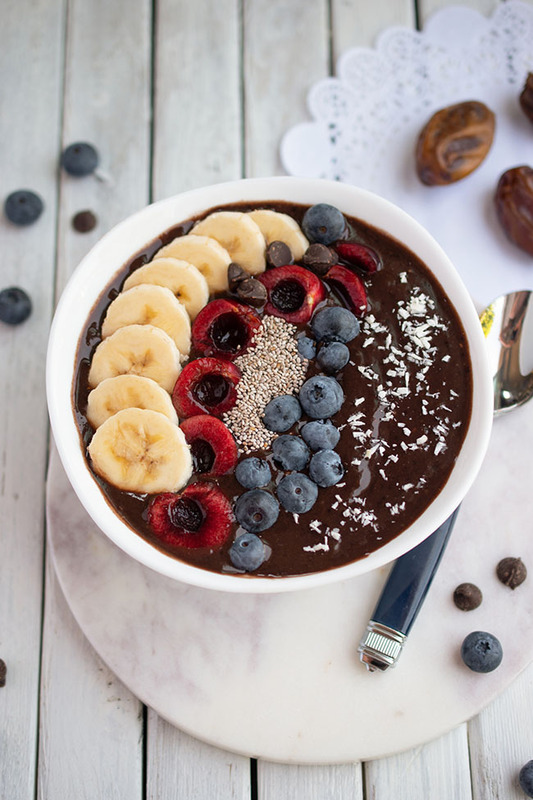 It relies on healthy foods that come from nature...and it's delicious! I went on to make the recipe for Protein Breakfast Bars. I love to whip together grab and go vegan bars that are good for you. I'm always hungry, so I need a steady supply of healthy goodies to keep me from buying some other crap while I'm out! These dense bars contain chia seeds, nut (or seed) butter, dried cherries or cranberries and pumpkin seeds, so they are very filling. I confess that I found them a bit rich at first, but then I became entirely addicted and ate three-quarters of the pan myself! 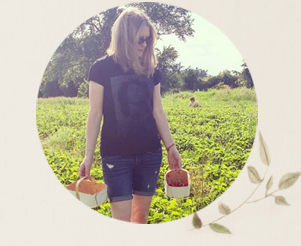 In celebration of spring and summer, I'm sharing Susan's recipe for Strawberry Salad with Mint Dressing and Greens. As she notes in the introduction to the recipe, this is a great dish to bring to an outdoor party. The greens (arugula and butter lettuce) join together nicely with purple cabbage, raw cashews, strawberries and fresh mint. 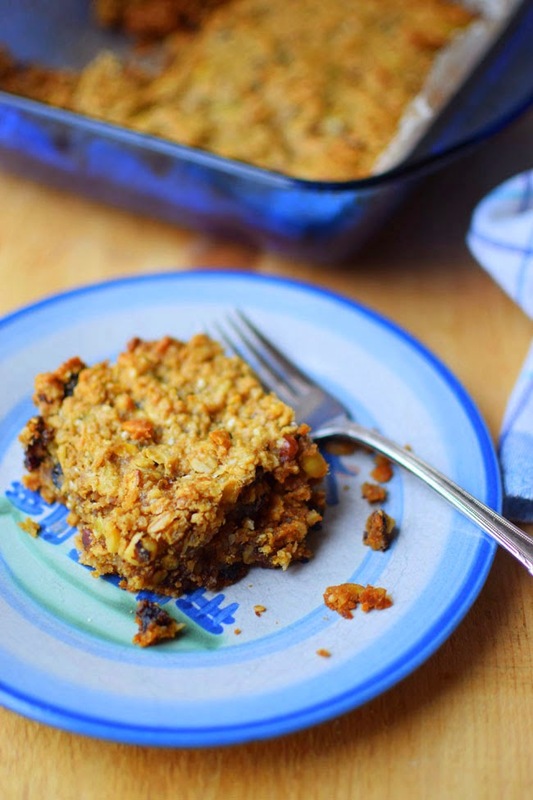 To keep the recipe vegan, omit the gorgonzola cheese and try a sprinkling of kelp flakes, sunflower seeds or mock parmesan cheese instead. 1. 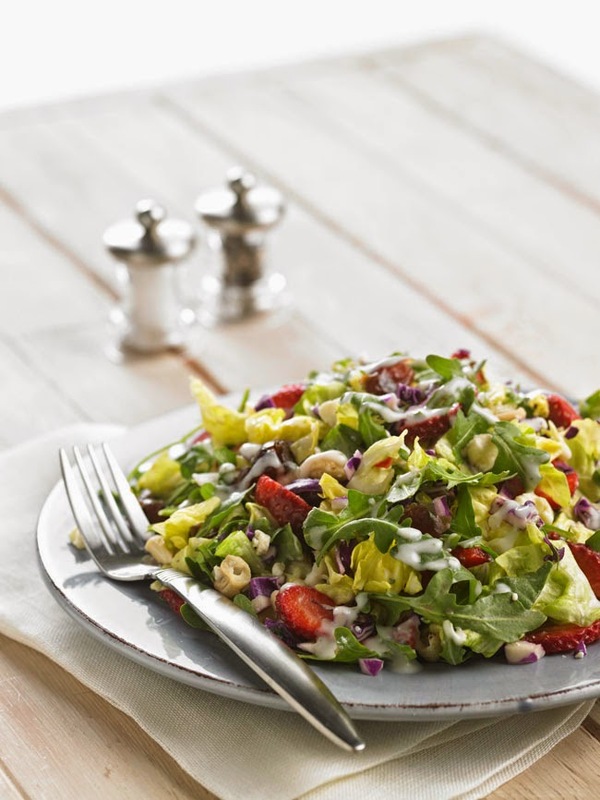 Put the cabbage, arugula, lettuce, dates, cashews, strawberries and cheese in a large bowl and toss to combine. 2. In a small bowl, combine the sour cream, orange juice, mint and salt and pepper to taste. 3. If you plan to serve the entire salad and not have any leftovers, toss the dressing with the salad ingredients. If you think there will be leftover salad, then serve the dressing on the side so the leftovers won’t wilt. Garnish the salad with fresh mint leaves before serving. Buy the book in Canada here. Buy the book in the US here . How often do you make gluten-free meals? Residents of Canada and the US may enter to win 1 of 3 copies of The Gluten-Free Vegetarian Family Cookbook using the rafflecopter below. Enter until May 18th. Recipes from The Gluten-Free Vegetarian Family Cookbook by Susan O’Brien. Reprinted with permission from Da Capo Lifelong, (c) 2015. I try to eat gluten free all the time. That soup sounds great. I usually have lentils, carrots and celery in my kitchen so it would be super easy to throw together. I don't usually intentionally make gluten free meals but could definitely use the boost in veggies! It depends on what recipes I can find. Daily, I have been gluten free for over a year. I have been making gluten free once a week. Every meal in our house is gluten free. I do it on occasion but I don't go out of my way. I do not cook gluten free but my niece has to. Usually only when my daughter comes over to eat as she is on a gluten free dinner.